I challenge Paula Deen to go VEGAN! 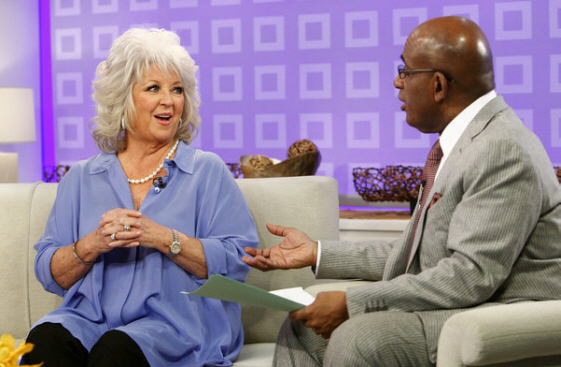 Paula Deen needs to take responsibility for her health. We love to criticize athletes and famous actors for not being good role models, but what about our Food Network stars? Paula Deen’s food is amazingly delicious, unhealthy, fattening, and has contributed to her diabetes 100%. If she were to eat a plant-based whole-food diet, she could rid herself of this nasty disease, but….she has chosen – for the time being – to give up and blame it on the scapegoats: lifestyle, genetics, stress. It’s FOOD, Paula! She knows it, and so do we. I challenge Paula to go VEGAN for 6 months and see what her results are! A whole-food, plant-based diet can oftentimes reverse Type-2 Diabetes, and a person can usually become free of his or her diabetes medications. She can cure herself by rejecting animal-based and processed foods. Funny that I had posted my healthy version of her Shepherd’s Pie only a week before I heard she had Type-2 Diabetes. Maybe I should email her, send her the recipe, along with other alternatives. Gosh, it’s inspiring to think of what she could come up with if she were to decide to start making healthy southern food. She is an awesome chef. Oh please Paula, conjure your magic and create 5 star vegan meals for us! I hope she steps out from behind her denial, for her sake as well as many others. She has a wonderful opportunity to help people (26 million Americans diagnosed with Type 2 Diabetes and 79 million Americans who have “Pre-diabates”) by taking the lead, setting the right example. I’m crossing my fingers. An amazing movie (documentary) claims the degenerative diseases that afflict us can be controlled, or even reversed, by rejecting animal-based and processed foods. Quit the meat, quit the dairy, and you can cure yourself? Watch Forks Over Knives. I am a believer, and I have been since 1997 when I went Vegan. My sources back then were not as well prepared and entertaining as Forks Over Knives. This movie is so easy to watch; it flies by. Myths, old-wives tales, and greed driven propaganda are dispelled so absolutely it will blow your mind. Degenerative diseases like heart disease, type 2 diabetes, and even several forms of cancer, could almost always be prevented, and in many cases reversed, by adopting a whole foods, plant-based diet. But do you want to believe it? I bet you don’t, because it’s just too hard….to give up your meat. Wishing you happy enlightenment my friends. Be good to yourselves.